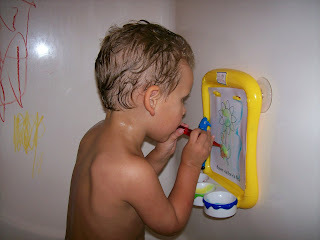 One of Dawson's favorite things to do in the bathtub is color with his bathtub crayons and paint with his special bubble-bath paints. He starts out using the traditional painting method - his hands. But soon he puts the paintbrush in his mouth and shakes his head around to paint the picture. 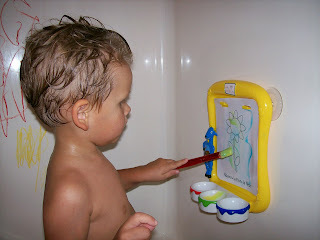 He learned this from one of his Baby Einstein videos which features a goat puppet (Vincent van Goat) that holds a paintbrush in his mouth to paint his masterpieces. We actually have this very puppet and sometimes when Dawson's coloring he'll go get it, put the crayon or marker in the goat's mouth and have it color. He's such a funny boy!